The world premiere of the stage adaptation of the book by Nobel Prize winner Imre Kertész. Fatelessness tells the story of a young Hungarian boy who survived the Nazi death camps. The production premiered at the HERE Arts Center in New York and was nominated for a New York Innovative Theatre Awards in 2014. O.Rex is a full immersion theatrical experience in film noir setting based on Sophocles' Oedipus Rex. The show takes back the audience to the era of the 1940's and into the nightclub of Theban club owner and underworld kingpin Oedipus. Directed by Gia Forakis the production premiered in Fall 2014 at the Alchemical Theater Laboratory in New York. Hungary Live Festival is the first Hungarian theater festival in New York, which took place between June 23-27 at several renowned NY venues such as the Abrons Arts Center and the LaMaMa ETC. It hosted several Hungarian theater productions, concerts, panel discussions and acting workshops. 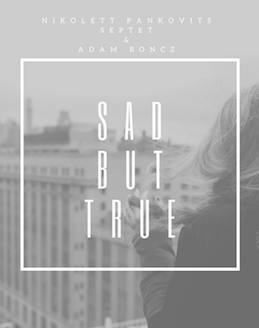 Based out of New York, Sad But True presents Nikolett Pankovits' collage of jazz and world music interlaced with literary excerpts and Hungarian poems performed in English by actor Adam Boncz. The two Hungarian artists with musicians from all over the world talk about homesickness, love, humanity, heart break through the common language of music. The New York premiere of Nina Sallinen's critically acclaimed one woman show. Poor Poor Lear is a dark comedy about a 90-year-old actress who stages King Lear in her own apartment as her farewell performance. After a highly successful run in Los Angeles and Chicago, the New York performances were co-produced with Gia Forakis. A new contemporary dance-theatre opera about history's four powerful women: Empress Wu, Cleopatra, Aung San Suu Kyi and Hilary Clinton. It is the fall of 2015 and the Presidency is at stake when these four women encounter one another at a fantastic power summit. First presented at The Baryshnikov Arts Center in New York City directed by Paul Warner and with world renowned ballerina Wendy Whelan as Cleopatra. Havasi - Voices of Change is a musicvVideo inspired by the famous song 'Amazing Grace'. Composed and performed by renowned Hungarian pianist Balazs Havasi, the music video also features New York City's very own Harlem Godspel Choir and young Hungarian singer Gigi Radics. Shot entirely in New york the video is directed by Peter Graf. Click on the image to see the clip. Retrospective video exhibition of Van Noten's work directed by David Michalek, commissioned by Les Arts Decoratifs in Paris. 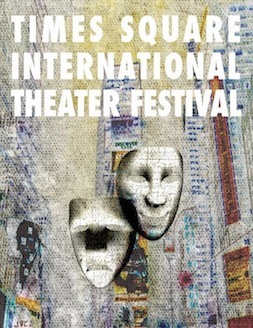 Times Square International Theater Festival was a week long event in NYC that gave the opportunity to many international artists to show their art in the heart of the theatre capitol of the world. The festival featured 16 productions including shows from Germany and from the Dominican Republic. Click on the image for the New York Times article about TSITF. A solo performance based on Christina Rossetti’s narrative poem. Told through the lens of southern Appalachia, themes of obsession, surrender, and redemption come to life in a haunting folk tale told by performer Jennifer Jewell. The production premiered in Nashville and was performed at the 59E59 Theatre in New York and at the Edinburgh Fringe Festival. This world premiere musical, with a complete book and eight original songs, bounces between the emotionally raw humor of “Hedwig and the Angry Inch” and the imaginative enthusiasm of “Pee-Wee’s Playhouse”. 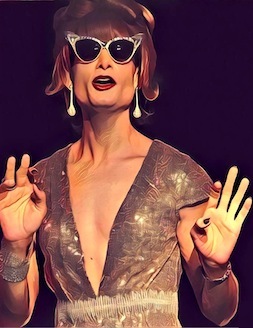 The show was part of the New York International fringe Festival and won the FringeFave award in 2016. A video installation commissioned by the International Center of Photography. The project will feature a selection of extreme-slow-motion individual portraits of men, women of all age and children DANCING in the state of joy to a music they will be inspired to move or dance to. A wildly diverse range of individuals from different ethnic, cultural, social, and professional backgrounds and persuasions will represent the colorfulness ofNew York City. Written and directed by Nathan Catucci, The film tells the story of an ambitious professor becomes caught up in the murder of a participant in his sleep study, as the line between dreams and reality blur. Starring Santino Fonatan, Dvika Bishe and Natalie Knepp. "The Independents" is a musical comedy/drama about three struggling singer-songwriters whose chance-meeting rekindles each of their fading dreams of making it in the music business. Written and directed by Greg Naughton the movie features Richard Kind, George Wendt and the band 'The Sweet Remains'. Created and directed by David Michalek Figure Studies is a high-speed HD video exhibition capturing super slow motion scenes reminiscent of the famous Edward Muybridge. The project was commissioned by the Edinburgh Fringe Festival, where it premiered to rave reviews. Figure Studies was produced by Dorottya Mathe. Twenty three artists are traveling from Hungary to help create a festive traditional market atmosphere at the Hungarian House of New York in September during the 3 day long festival with many interactive workshops based on Hungarian traditional arts and crafts. The street fair will be located on 82nd street between 2nd and 3rd Avenues, in front of the Hungarian House of New York. The festival will focus on Hungarian traditional arts and crafts, folk music and folk dance, however there will also exhibits of folk art-inspired works by some outstanding contemporary artists.